In their first full season at Tim Hortons Field in Hamilton, Ontario, the Tiger-Cats were the only football club in the CFL to sell out every 2015 home game. Since moving into their brand new stadium, the club’s philosophy has been driven by the goal to deliver fans a best in-class experience in Canadian sport. Ticats All Access became the primary destination where fans came to consume everything from fantasy to contests to sponsor offers, in turn, creating one, simple and manageable relationship. 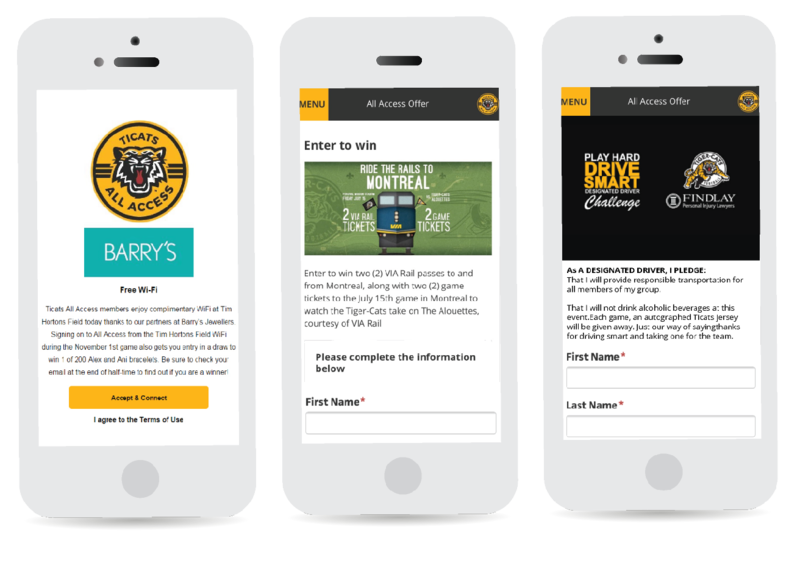 Through that single relationship, All Access provided the Ticats the insights needed to better understand their fan base by relating behavioural digital engagement data to incremental spend, purchases, online consumption, and corporate partner activations. the Hamilton Tiger-Cats would make a limited number of complimentary pre-season game tickets available exclusively to season seat holders. The missed opportunity of the past however was understanding who, outside the season ticket holders, were actually using the tickets and establishing a means to contact them in the future with revenue generating ticket offers. 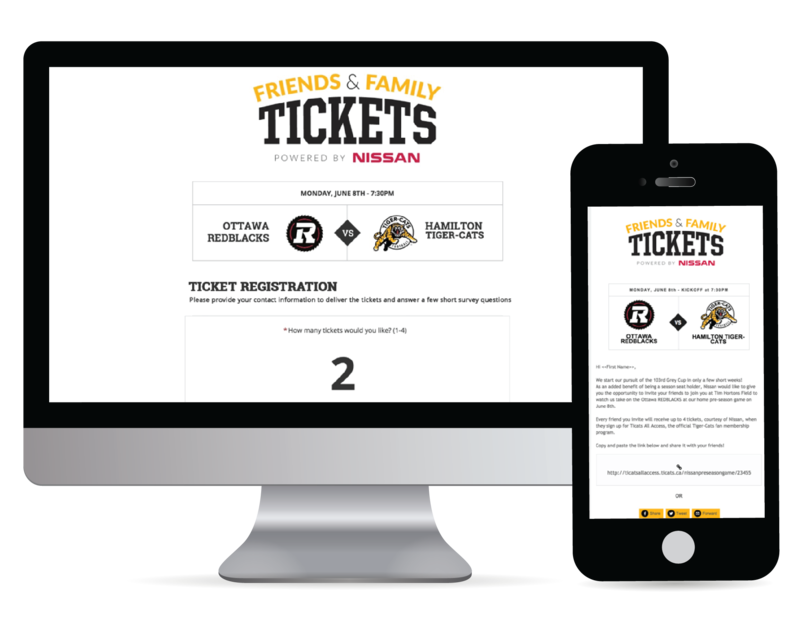 For the start of the 2015 season, the Ticats partnered with Nissan as part of the launch of Ticats All Access, with the Friends and Family pre-season ticket giveaway. By signing up for All Access, fans could claim up to 4 pre-season tickets, which was tracked by a custom URL sent to all season ticketholders who forwarded it on to their network. *Average basket size represents average transactional purchase at the Ticats Shop and Tim Hortons Field. destination for all fan-related activities. 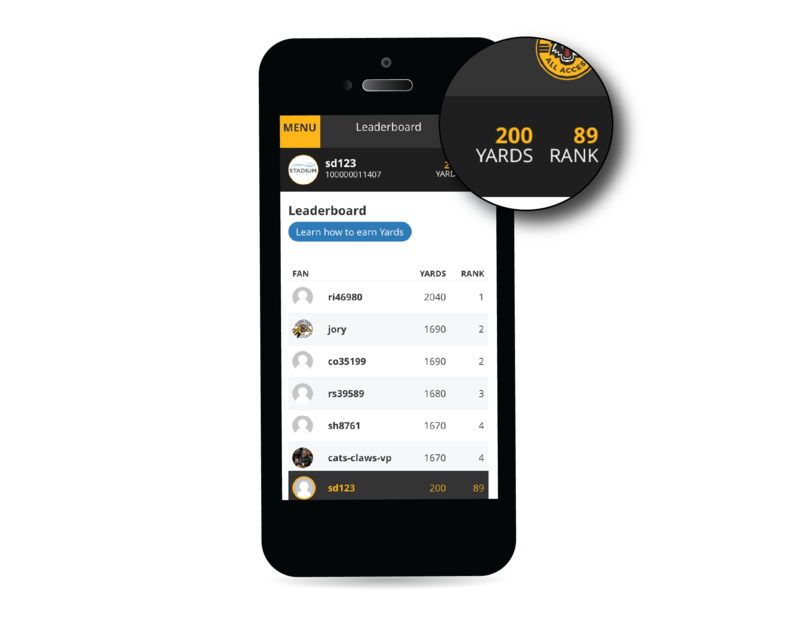 Built around a 48hr gameday window, the Ticats rewarded members for their interactions on All Access with a focus on Fantasy. The fantasy game awarded fans points for their first prediction, correct predictions, and bonus points for making picks early. Prizes were then awarded to the top three Gameday Challenge leaders each week, which included trips to away games and private meet and greets with players. The Leaderboard was also displayed on the video board in-stadium. partners are now able to track who clicked, viewed, and engaged with their activations right down to the user themselves. Partnerships with sponsors like RedTag.ca, WeatherTech, Buffalo Wild Wings, Via Rail, Barry’s Jewelers, and Lou’s Barbeque, became significantly more valuable now that the Ticats-Cats are able to target, track, and expand the reach of the partner’s on-site and online activations in a highly engaged environment completely controlled by the team. Stadium Digital's web-based platform supports critical aspects of a property’s digital business, including fan engagement, loyalty, gaming, e-commerce and sponsorship. Whether you are a team, league, sport federation, venue, or event, integrating Stadium Digital’s platform into your property’s existing digital initiatives will support revenue growth and brand loyalty.